ThreatLocker® gives your I.T. department control over what software can run, and storage devices can be used in your organization. This control reduces the risk of a cyber-breach. If you have ThreatLocker installed on your computer, you will notice a small icon in the tray with a lock. 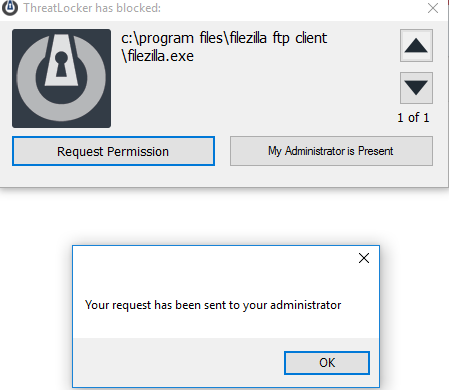 When trying to run an unapproved application it will get blocked by ThreatLocker, you’ll receive a popup notification with the file or files which were blocked, a button to request permission and a button labeled “My Administrator is Present”. Selecting “Request Permission” will send a request to your administrator requesting permission to the application.